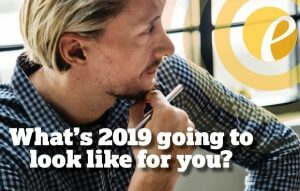 What is 2019 going to look like for you and your family? If you’re stuck in a dead-end job, spending your time making money for someone else, and hoping your year-end bonus isn’t a “pink slip”, your most likely answer: Another job. It’s a New Year – Time to stop settling for the “New Normal” ! It’s no secret hundreds of thousands of people are unhappy in the workplace, dissatisfied with their career path, and pay, and just hanging on, hoping it will get better before they retire-or are forced out. Self-sufficiency is a only dream, until you write it down – then it becomes a goal. Financial freedom is probably not possible in your current position. Salaries just don’t grow nearly as fast as they did years ago, and they’re not likely to again. Do you want the option of becoming self-sufficient, and earning what you’re worth, and not just a paycheck – which could vanish with the next corporate merger? Let’s face it: what got you here, won’t get you there! People today don’t mind working hard, especially if it directly benefits them. Do you want a career which offers you more flexibility and freedom, or are you thrilled with telling your family over and over there’s no time for a vacation? There are no guarantees that all the hours you put in mean your job is secure, so why keep playing that game? This is the by-product of an increasing income. You not only fund your current lifestyle, but entertain options to grow real wealth. The kind of wealth which can help secure yours and your family’s future. While you’re living paycheck to paycheck, like millions of Americans, can you even dream of growing your net worth? Also, are you that confident the money in your 401K will be enough for retirement, or even be there when you do retire? How much of your current job do you own? Unless you have stock in your company – not much. Real equity comes when you own your own business, and it becomes an asset you can use as you pay off debts associated with it. That’s another positive option of being self-sufficient. Plus, it can be passed on to the next generation, if you desire. Gathering the facts and using Your Career 2.0® and The Entrepreneur’s Source® as your Guide. There are many options to becoming self-sufficient, but to make sure your goals are realistic, you’ll want to discover how others, just like you, have accomplished taking control of their lives and financial futures. You also have to be open to blowing up the old ways of thinking. Yes, that’s scary, but if you examine the facts, not run with emotions or preconceived ideas, and be truly willing to explore, you might find yourself ready to break free of the career bonds that hold you back. The Entrepreneur’s Source® can offer that education, awareness, and discovery through Your Career 2.0® and our network of award-winning alternative career coaches. They are highly trained, and many have been right where you were: at the same career crossroads, choosing to become empowered rather than just employed. They have the “cred” to shepherd you on your Journey of Discovery. If you would like the opportunity to have more control over your professional life, while enjoying the Income, Lifestyle, Wealth and Equity you deserve, The Entrepreneur’s Source® wants to talk to you. Just complete all five steps of Franchise Match to take the first step toward your new alternative career. Ready to consider franchise business ownership as your next career?